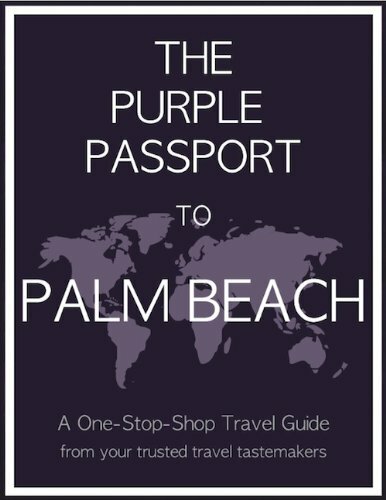 The Purple Passport to Palm Beach is part of the eBook guide series by The Purple Passport. Essential reading for hip, discerning travelers and on-the-go locals, the Palm Beach guide provides insider tips on the South Florida resort town’s choicest hotels, nightlife, restaurants, shopping, sights, and spas. The carefully curated selection of venues, organized by venue type for quick and easy reference, allows readers to create distinctive Palm Beach experiences. These include checking into a lavish, grand dame resort inspired by Rome’s Villa Medici with a pamper-you-silly beach club; capping off a spa day in a relaxation garden complete with hanging chairs over a reflecting pool; shopping for everything from couture gowns to flirty resort wear amid lush, flower-lined vias; scoping original Pollock and Picasso canvases under a Chihuly glass ceiling; dining on delicious Milanese fare while taking in the buzzing crowd on the hottest see-and-be-seen restaurant terrace; and dancing the night away at Palm Beach’s best party spot. Helpful maps and city-orienting information about transportation, seasonal highlights, and local culture are also included.